LOTTA: Why Guwahati's Kangkin Kebang flopped this year? Why Guwahati's Kangkin Kebang flopped this year? Over the last three decades, the Mising student community with full support from the citizens of Guwahati has been celebrating Kangkin Kebang, literally " Know Gathering/ Assembly", which means a meeting to know each other. It's formally organized once in a year among Mising youths comprising largely of senior and junior students. The venue of Kangkin Kebang 2013 (KK'13) was at Kalaguru Bishnu Prasad Rabha hall ( KBR ) in Cotton College on September 15. 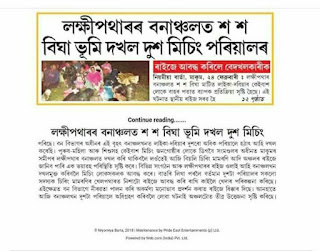 The organizer of the KK'13, the TMPK, Guwahati City Committee was criticized badly by the student community for the program did not happened as it was supposed. It is said that the Cotton College students were also left discontented. The failure of kangkin kebang became open of social media with many girls and boys expressing about the program. On Facebook some were critical of the Gomug mouth piece, others were dissatisfied with long lectures without any entertainment break. Was this year's kangkin kebang the worst of all? On October 14, 2013, after almost a month, we had the opportunity to sit down and talk about the flop kangkin kebang. Lila Taye, the president of TMPK, GCC, Rhitu Kumbang and Tanuj Tayeng, all are affiliated to Gauhati University, and I discussed the issue. Lila pointed out that the main reason for failure was financial reason. Organizing members including himself were running managing bucks till the hours of kangkin kebang schedules. Besides, when Ganesh Pegu and I was asked to anchor the kangkin sunam (introductory program of new and old students), the backstage arrangements such as musical instruments to start off with chorus, was not ready enough to kick off. So, we took more than hour. The program started very late behind schedule. This also prevented the revelers from having entertainment. The invited guests lecture series ended in the evening with a lively performance of Gumrag dance by students of Cotton College. Cotton College's Gumrag was the face-saving mask of the kebang in the name of cultural program. It really thrilled every watchers. Why Kangkin Kebang is a serious issue? Kangkin Kebang is a social gathering exclusively organized for the youths. The new generation students are the society's future of tomorrow. Kangkin Kebang, going by it basic meaning, we might not understand the importance. Our friend Rhitu had said, it's not just a gathering, it has become an institution of society. Kangkin Kebang is the only program meant for students in the Mising society. Over the decades of practice in various towns and colleges, Kangkin Kebang is evolving itself to be a social institution. It must be well organized in such a way where youths in towns and cities get to interact and introduce not just with new friends, but with the society's traditions, cultures, literature and language. When top personalities lecture before the students, these issues are always cared for. During my college days at Cotton, I was actively involved in organizing three kangkin kebangs. Of course, now a days with academic pre-occupation I am off from raising funds and circulating invitations actively. This too makes a good a experience being in an organization. Lila, Rhitu and Tanuj, had recounted their experiences while going for raising fund to organized kangkin kebang. What left me shocking, the encounter they experience with some big people; Some "big people" of Mising society simply doesn't want heed to KK invitation because their name are not printed in the program sheets. What they meant, since my name is not printed I'll not come to Kangkin Kebang, neither I'll help in donation. Of course, there are equally some excellent people, they never care whatever is printed. They come forward with cash and kinds to make the event successful every year.